Mike Gavronski is headed to America’s Playground. Gavronski (24-2-1, 15 KOs) will take his biggest step towards a potential world title shot when he faces super middleweight contender Jesse Hart (24-1, 20 KOs) in the 10-round co-featured event during Top Rank Boxing on ESPN, Aug. 19 in Atlantic City, New Jersey. Headlining the card at the new Ocean Resort Casino will be a main event between heavyweight contenders Bryant Jennings (23-2, 13 KOs) and Alexander Dimitrenko (41-3, 26 KOs). Both fights will air live on ESPN and ESPN Deportes at 10 p.m. ET. The entire card will be streamed live on ESPN+ beginning at 7 p.m. ET. The bout between Gavronski, ranked No. 11 by the World Boxing Association, and Hart, who is ranked third in the world by the WBC and 10th by the IBF, will be for Hart’s North American Boxing Federation super middleweight championship. Gavronski, a native of Tacoma, Wash., will bring a five-bout unbeaten streak into his showdown with Hart. The 32-year-old Gavronski is 4-0 with a no contest since losing to Dashon Johnson on Nov. 7, 2015. During his current streak, Gavronski has notched victories over the previously undefeated Jake Carr, former contender Brian Vera, Quinton Rankin and knockout specialist Thomas Awimbono. “Gavronski is a good test. 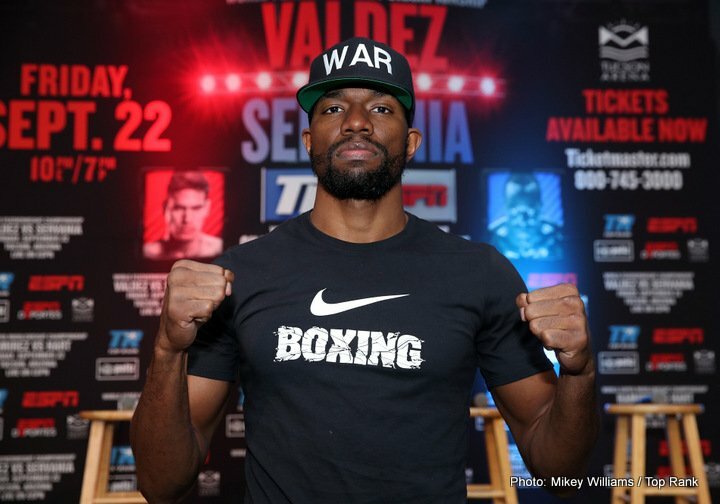 He’s durable, and I know this fight will be great for boxing and boxing fans,” said Hart, whose only career setback came last September when he lost a decision to undefeated Gilberto Ramirez in a bout for the WBO Super Middleweight title. Hart has since won his last two fights, knocking out Awimbono in February and defeating Demond Nicholson by seventh-round TKO in a bout for the NABF super middleweight title in March. Before during pro in 2010, Gavronski was a local amateur sensation. Training with the prestigious Tacoma Boxing Club, he was a three-time Tacoma Golden Gloves champion, winning the 165-pound title three consecutive years (2006-2008) and earning the prestigious Tacoma Golden Boy title, which is presented annually to the tournament’s most outstanding boxer, in 2008. Tacoma Boxing Club, Gavronski’s first gym, has a history of producing world champions and gold medalists. Tacoma natives Ray Seales, Leo Randolph and Davey Armstrong all captured Olympic Gold, while Randolph, Johnny Bumphus, Rocky Lockridge and Freddie Steele all captured world titles. Gavronski responded to the setback by winning his next six bouts, including a victory over highly regarded journeyman, Dashon Johnson.